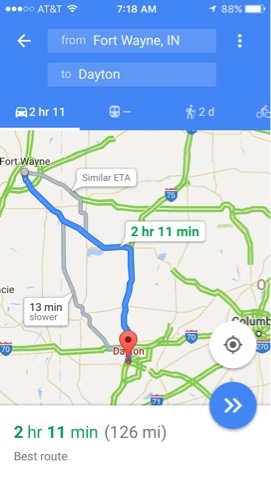 On Wednesday 3/20/16 (Day 108) I drove from my aunt's house in McHenry, IL to Dayton, OH in to trip segments. I always get around Chicago by taking interstate highways, but whenever possible I like to take US Highways or even state or county roads. My goal in taking rosds other than interstates is to drive through cities and towns that interstates pass by and I just love the scenery. I love the farmland and the little things I see in the spring with farmers preparing their fields for spring planting. 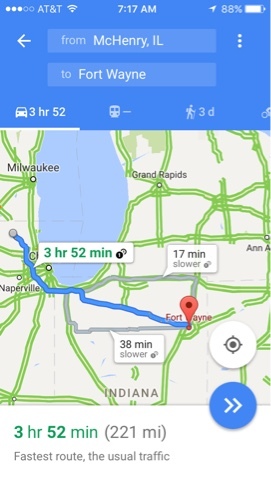 After getting through the Chicago area I set my sights on Fort Wayne, IN. I had to override my GPS many times today to stay on roads that brought me through towns. Fort Wayne was just that situation where the GPS kept telling me to go around on bypass routes and I kept going through the town and the GPS scolding me. The next leg of my trip ended up being Dayton, OH but could have been anywhere in OH. I checked a rest area and they are posted for 3 hours max and no overnight parking so I opted for a truck stop in Dayton to overnight park, getting there about 8:00 pm, 12 hours after I left my aunt's in Illinois. On the way to Dayton I stopped in Decatur, IN to play a 9 hole disc golf course to break up my drive. I will post a blog on this course separately. 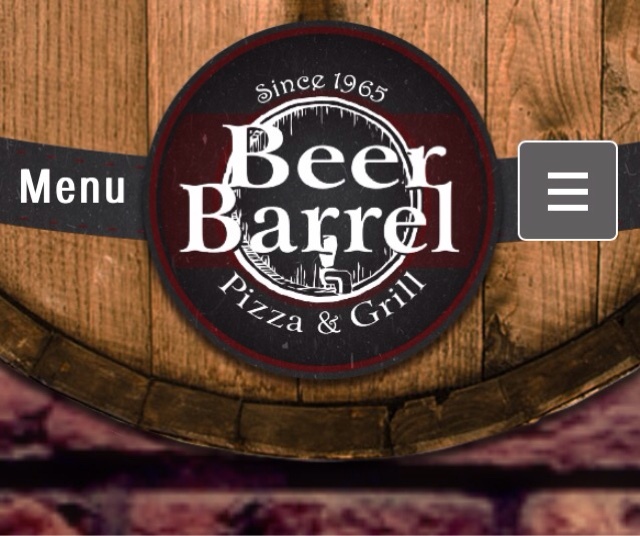 It was a good restaurant with good service and a nice verity of food offerings.